West Philadelphia is one of most vibrant and diverse sections of the City of Philadelphia. 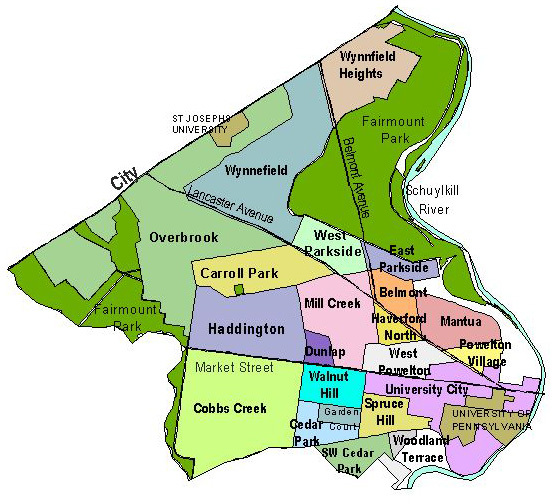 Consisting of more than 20 distinct neighborhoods, it stretches from the western shore of the Schuykill River to City Avenue to the northwest, Cobbs Creek to the southwest, and the railroad tracks used for the SEPTA Media/Elwyn Line to the south. Primarily a residential area offering diverse housing options ranging from small rowhomes to large victorian and colonial mansions. Within its boundaries also lie some of Philadelphia's greatest attractions and institutions such as the Science Center, University of Pennsylvania, Drexel University, St Joseph's University, The Children Hospital of Philadelphia, The Philadelphia Zoo, The Mann Music Center for Performing Arts, The Please Touch Museum, 30th Street Station, Woodlands Cemetery and hundreds of acres of parkland primarily found within Fairmount Park. Most outsiders still stereotype West Philadelphia as the distressed, high crime area that existed in the late 1970's through the early 90's. However over the past decade the residents and institutions that exist within West Philadelphia have worked together to help it evolve not only into a great place to live but also into a hotbed of education, science, medicine and research. West Philadelphia today is a dynamic, racially and culturally diverse, yet close-knit community. It is home to the rich and poor alike, college students, artists, and families who all coexist amid world class universities, dining, nightlife and other cultural offerings. For information on the neighborhoods that make up West Philadelphia, simply click on the neighborhood you are interested in shown on the map provided.